In an epoch where indie titles are often outdoing mainstream games in success and sales, simulation games have finally found their stride after a decade of dormancy in the aughts. Between the tycoon titles and the city builders, this narrow niche of the strategy genre is built for smaller studios and tightknit teams. No better example was when Cities: Skylines showed up SimCity and its sprawling team with a significantly smaller budget and a tiny team. 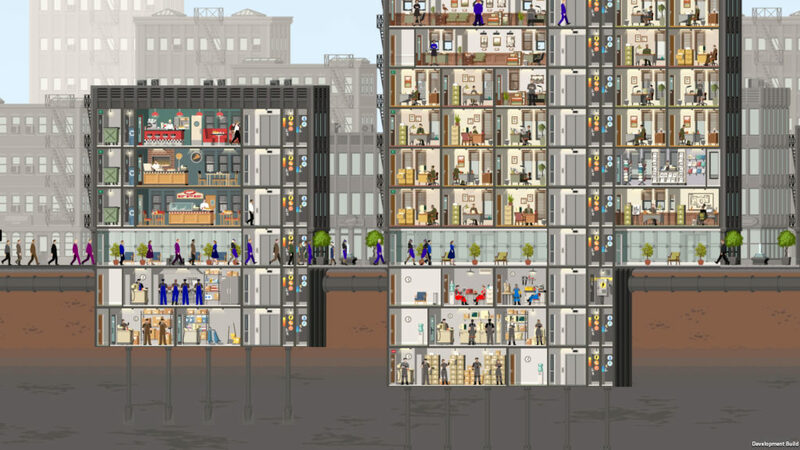 Project Highrise then is latest entry to the tycoon line of games from another indie developer. In it, players build a singular tower and populate it with offices, storefronts, apartments, and more spaces to keep their tenants and visitors happy while managing the day-to-day upkeep of the tower and profit margins. It’s very much a stylized attempt to rebirth a 1990s classic Sim Tower and its successor Yoot Tower with more modern systems and technology. It does an amazing job at replicating the gameplay of those two titles. 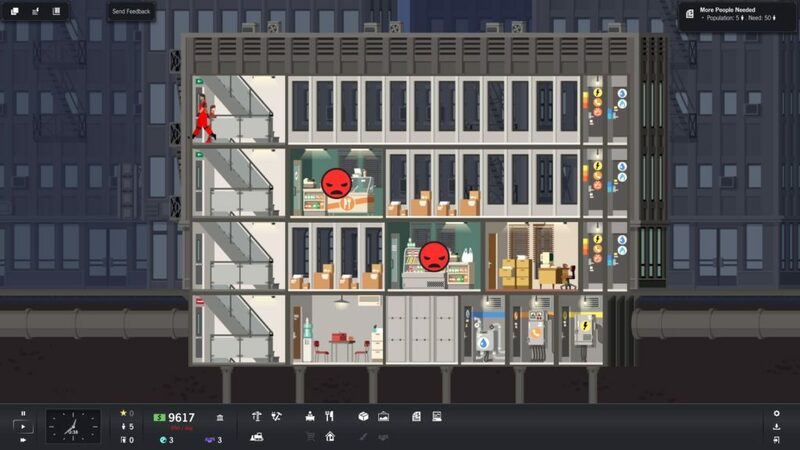 Highrise is everything a simulation game should be—a very solid entry to management simulators. It’s satisfying to erect a skyscraper and grow it, watching it eventually tower over the city. It’s even more devastating to watch it slowly burn, with angry tenants leaving and profits falling. This investment to your tower’s success comes from how incredibly well Project Highrise succeeds at the core game mechanics. Its construction sequences are very meticulous and unforgiving; creating room for everything and laying it out in an orderly, intuitive way is a difficult and rewarding task. Power, phone, and plumbing lines have to be placed to keep certain tenants happy and that means building them in the proper places while building locations that need them on the same floor. Tenants have demands as well, wanting everything from copy machines to courier services. Even storefronts need to be varied to meet different requests, like preferring to be in a busy area or having waste removal services. There’s an added difficulty of meeting the city’s requests, too, such as population goals to be met and diversity in office fronts. And that’s just the tip of the iceberg. There are countless ways to manage your tower to the minutest of details. Aesthetic features unlock through various goals being met allowing players to change the decoration of an office or the lobby’s wallpaper. For those more into getting their hands dirty, Project Highrise is so in-depth that the game’s residential living spaces deteriorate, causing maintenance workers to have to come clean up the place so that its inhabitants are happy. But for all of its aces with strategy, on the flipside, Project Highrise simply lacks charm. The tower you build will feel sterile at times and lackluster at others, an expanding mass of grey and hard lines. A large part of this is due to the art style which feels cold and detached—as well as simply on too big of a scale. Single characters represent an entire office and it doesn’t leave the impression of a bustling, hectic tower. Where titles like Yoot Tower filled their elevators with dozens of silhouettes, showing hundreds of characters making their way through a tower through the day, only a handful will walk through Highrise’s halls on an average day. The style itself is a personal preference to some degree, but it simply doesn’t contain much to look at and lacks a memorable style. This call was likely due to the success of Tiny Tower—a mobile strategy game that garnered a lot of interest before petering out as players realized its lack of depth. Project Highrise likely adopted a more conservative art direction in an attempt to distinguish itself from the taste Tiny Tower left in many gamer’s mouths. 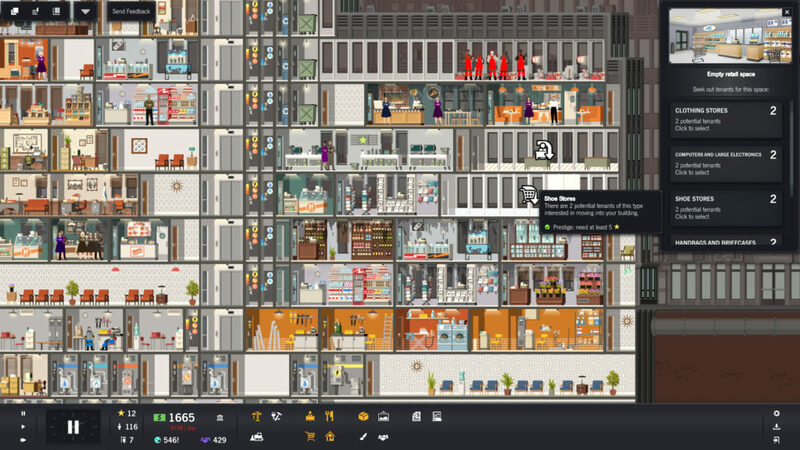 By going as far away as possible from its competitor’s pixels and pastels, Highrise’s developers were probably hoping to leave a more serious impression that’s more in line with its detailed strategy and complex macro game while keeping its familiarity of large scaled denizens and interactive rooms to draw in Tiny Tower’s former fans. However, ultimately it went a little too far and stripped a lot of its personality along with it which may make it less memorable to newcomers of the genre. For strategy fans, however, Project Highrise is a real treat. It’s a modern Yoot Tower and that is one of the biggest compliments a genre fan can give. Its game systems are incredible, even if its art can be off-putting. It lays the groundwork for a perfect tower simulation and lets you take control. It’s completely worth a purchase. Review code for Project Highrise was provided by the developer. The game is available for pre-order on Steam.